"My grandmother supported her family during the Depression by baking. This is her recipe for pie crust. I use this often as I am a pie baker. The trick to good pie crust is to be gentle and treat it very lightly." For a two-crust pie, trim bottom crust to edge of rim, fill, and top with crust about 1/2 inch larger than rim. Tuck top crust under bottom along rim. Seal with floured fork. This was too greasy and almost TOO tender for me - the crust was falling apart in the finished product! I will use 1/3 cup shortening next time and up the water by a couple of Tbsp. Good also if you substitute shortening with butter or margarin. Incredible. The only thing I changed is I used unsalted butter instead of shortening. Was a breeze and was so good. 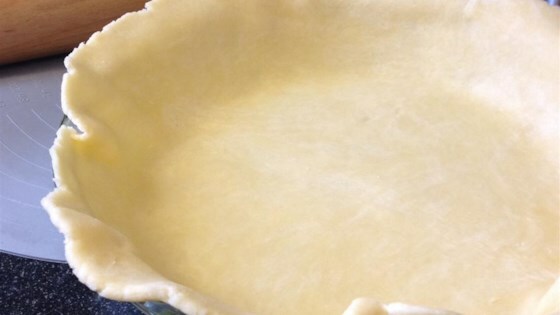 Use iced water to make a better pie crust! I also put it into the fridge for 30 mins after making it to make the pastry easier to work with.